I'm slowly but surely catching up with A Lab On Fire, a New York-based "niche" line that hasn't always been easy to find, even in New York. Liquidnight, developed by perfumer Carlos Benaïm, was released in 2012. It was inspired by "the hidden depth of the night in New York City" and it includes notes of bergamot, lime, saffron, sage, lavender, hinoki wood, incense, vanilla and musk. Just when I think Liquidnight might be a little too masculine for me to pull off, its base notes change my mind. There's a warm, non-foody vanilla in there that feels comforting and sophisticated at the same time, and the musk meshes beautifully with my skin. Liquidnight has mild sillage and above-average staying power. It's not as "me" (i.e., floral-sweet and traditionally feminine) as What We Do in Paris is Secret or Rose Rebelle Respawn, but I enjoyed experiencing its evolution and spending several afternoons (and nights) in its company. 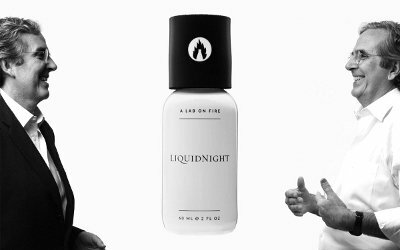 A Lab on Fire Liquidnight is available in 60 ml ($110) Eau de Parfum. For purchasing information, see the listing for A Lab On Fire under Perfume Houses. Thank you for the review. have you smelled the CdG x Monocle Hinoki? If so, how do they compare? Hi, M-toe — it’s been a little while since I sniffed the CdG Hinoki, but I remember that one as being more cedar-woody, where this one has the lavender and the subtle vanilla and incense smoke. I’m still peeved off at myself for purchasing off eBay 15mls of Rose Rebelle having mistaken it for Rose Rebelle Respawn, the one I love. I’d like to try Liquidnight – great name and I do appreciate lavender notes. Darn — all those permutations of 100% Love/RR/RRR *are* confusing! I love lavender and non foody vanilla. I’ve wanted to try this but like you said its not a line that’s easy to find. It does sound like it leans a little masculine but maybe layered with something a little more floral would make it more you. I bet some of the decanting services would have samples available by now…? It’s been available online for a while (Luckyscent, etc.) but I’m spoiled and I like to smell things in actual stores. Have you tried Brecourt’s Mauvais Garcon? It is a lavender/vanilla scent. I had a small sample of this at one point that I used up in one go. I recall really, really liking it but I think it veered sweeter and less masculine on me.